From "The Suffrage Cook Book, (1915), by L. O. Kleber. It's a lot of sifting, but on the other hand very little beating in spite of all the eggs — so maybe somebody with plenty of time and an angel cake pan with feet, would like to try this recipe. 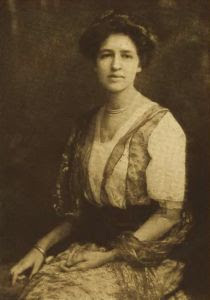 I haven't been able to find out who Miss Eliza Kennedy was, other than that she was a suffragette. Margaretha, perhaps one is meant to put the batter into the pan with one's feet?